To take on this topic of how to start a small business and succeed let’s first start with understanding where business ideas are born in the first place. Business ideas come from our thinking. I think this would be a good idea. I think I could do this better. I think they are doing that wrong, I could do it better. It all starts with an “I”dea! Meaning the idea comes from you. Initially, a business simply is an “I” statement. How do we take our “I”dea! statement and turn it into a business and then a successful one at that? The “I”dea! will collapse under its own weight if it is not connected to the one thing even more important than the brain. What is more important than the brain? The correct answer is our heart. Without the heart pumping the brain doesn’t work. Making the heart more important than our brains. If our heart isn’t in it then it will be impossible to tap into our passion. Business is hard. It isn’t easy. If it was easy – everyone would do it. Passion is any powerful or compelling emotion or feeling. We need this energy to bring life to our business idea! We need it for all phases of the business cycle. A cycle made up of normal highs and lows over periods of time. That passion is also the very thing that will attract employees, investors, customers, and so much more than one can imagine. What if I look really, really, really stupid? Those are the obvious negative thoughts that can take up space in our head all with attachment to fear of failure. It is extremely important not to deny our doubts. If we deny or bury them – they will return later on down the road. They’ll return right during the normal down turn of a business cycle (something that is out of our control) and our ego will personalize it. It will tell us that the failure is our fault. It isn’t. It’s just a natural part of a business cycle or the economic cycle. I’m not ready – no business owner is ever ready. Jumping in and just doing it is critical. We will never know everything that we need to know. Those are things we pick up along the way of the journey. Who am I to do this? – The truth is starting a business is an even playing field. We simply just start it. Usually this question is a deeper one about not having enough resources like capital. You can get capital either through customers or investors. You’re the person with the idea – making you the person that has to start it. This is crazy? – Is it really crazy to start a business? I don’t think so. What I think is crazy is to work for a company under a false sense of security. They will let you go the minute you no longer serve their needs. That is what is crazy. It isn’t security. It’s slavery. What if I look really, really, really stupid? – Please by all means get comfortable with looking stupid! It will happen. The good news is that again we can learn from the stupid things we do. The only really stupid thing would be not to try. What’s the worst that can happen? That we fail and either have to do something else or take a job. None of it is the end of the world. There’s a fantastic and famous book called Feel the Fear and Do It Anyway. If you add your fear in the comments then a few things will happen. One you’ll see that you’re not alone. Two, I’ll jump in and give you a solution to any challenge. Okay, so we’ve got the head, heart, and passion pumping – these are the three things that allow us to get started. They give us the insight, emotional energy, and the power to move forward. We’ve addressed our inner doubts and beaten them by simply accepting that we can accept the worst outcome. Remember starting a business will have one of three outcomes – (a) the small business works out and we make money or break-even (b) the small business needs outside help and to keep it alive we bring in outside investors or (c) the small business doesn’t work and we get to do an autopsy. What did we do right? Wrong? Accept it and move on to the next adventure. Understanding that most business outcomes are not a binary event is extremely important to success. One of the biggest problems most business executives tap into is having to make too many decisions. Too many choices. Here’s a math tool that will help you to move through decisions. It will help you to statistically prevent mistakes on a statistical level. It’s called the Monty Hall Problem. Use this link to read about it and play the goat game. Great so we’ve got most of what we need to move forward with our business. There is just a bit more inner work to carry out – if we want to succeed. I’ll be honest in the beginning I would skip over these steps. Yet, I would always find they would materialize later in the business cycle. Now I simply take care of them on the front end. We are human. We change. We learn. We grow. It is hard though to see this on a day-to-day basis. Yet the truth is we are never the same person as we were when we went to bed. Our subconscious minds sorts out, processes things, and helps us to become aware of what we might be missing. Then it will show it to us in dreams. The subconscious mind can only speak to us in symbols. It’s up to us to listen. What is the real cost of my business? Hint – it isn’t just financial. There’s are emotional, physical, mental and spiritual costs as well. What is my real break-even? Hint – we have to add up all the costs in number one and put a financial number to it to make it tangible. How am I going to track my progress? – without a system most business owners will fail because they will either overreact in a down cycle or miss warning signs of a high cycle. How much money do I need to survive three-years? Many businesses fail simply because they think too small and don’t have a handle on duration needed to go from no money – to break/even – to profit. Who is my team? How am I going to compensate them? What are my expectations of them? What are their needs from me? What is my exit strategy? This is the one most people fail to answer – but is critical for success. That is a selfish approach structured to help us feel good about us. It would feed narcissism because it exaggerates our own importance, takes advantage of others to reach our goals, disregards the feelings of others lacks empathy and those are just a few of the symptoms of Narcissistic Personality Disorder. For a business to really succeed teams need a system of creation and management. Fortunately, there’s a known process for that called forming-storming-norming-performing. The only why we should ever be worried about is why they would want to work for us? We can’t do that by making them all try to think our way or to even put the idea that there is one path to success – there isn’t. There are an infinite number of ways to get from nowhere to somewhere. Look at that list again. Notice a pattern. These are all questions we have to answer to find out how to best serve the group. It is the group that will build a successful business – not us alone. Those questions are just seven of the many questions we have to ask, answer, and consider when doing a business. What I want or need really stops to matter once I start the business. Why? Sorry, couldn’t resist. Meaning we have to give them a reason to follow us. Now this will depend on our product or service and the answers are different for every business. That’s the fun of the journey. Figuring that puzzle out with a team. The sooner and faster we make decisions – the better we increase our chances of success. Why? Okay, I promise last time for that dig. It shows leadership. Groups, team members, workers, partners, investors, customers crave – leadership. Throw the why out. Worry about the other important questions that need mental attention and decisions. What services and products do they want from us? What services and products do they not want from us? When do they want to buy from us? How will they pay us? Many people are fans of business plans to get the answers to those questions. Honestly, though business plans are great if you’re using them to raise capital. Yet, fairly useless for a business owner. With a small business the formula isn’t too complicated. We have a product/service. We need to get customers. We need them to pay us more than it costs to make the product/service. We need to repeat that as many times as possible until we sell our business. All of these items are the things we need to pay attention to if we destined for a successful business leader path. We begin to see a pattern. The more questions we ask and answer the better chance of survival. This means awareness of our business strengths and weaknesses is important. When Ygetarts works with a business our focus is on effectiveness, teamwork, culture, and processes. We never tell a client what to do. We simply offer them three options to match various levels of risk tolerance. Change is not easy and fortunately smart minds have found an excellent process for businesses to change. They will be found in a book called The Heart of Change: Real-Life Stories of How People Change Their Organizations. However, that is not the case for someone starting a business because their organization hasn’t formed, yet. Creating a business culture from scratch seems daunting. You’re in luck. There’s an actual cultural model and it’s a bit of an onion. Geert Hofstede has written several books on culture for those that want to go deeper. Yet, here is a simple visual of the model. 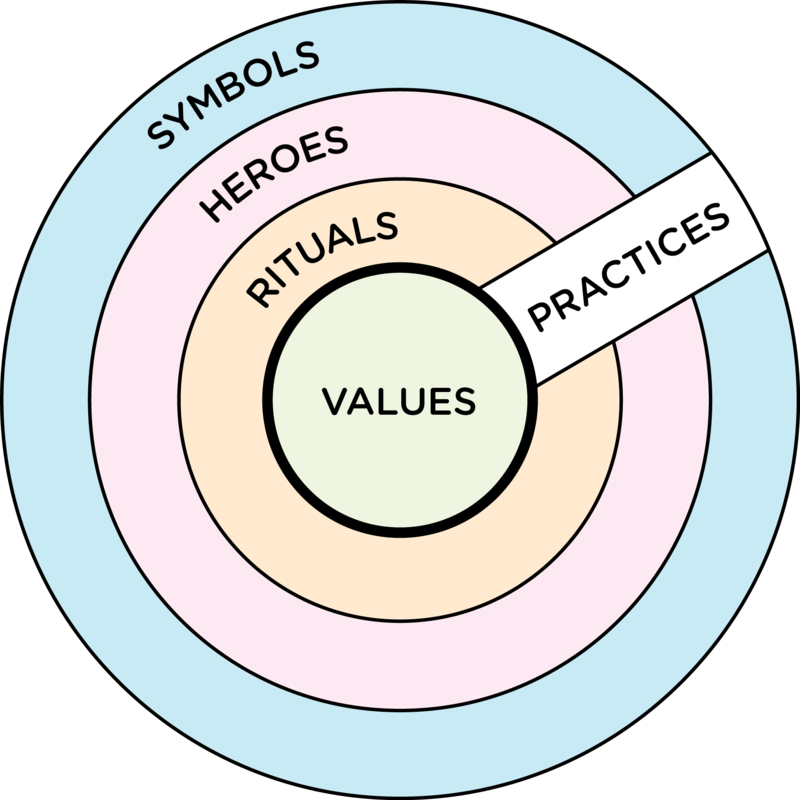 For business purposes we begin to see how critical “group values” are over “individual values” because they are at the center or heart of the circle. Think of practices as how your team functions or fails to act on a day-to-day basis. Rituals will be the things that everyone does. This way people not only feel a part of the group – they function as a group. There is always strength in numbers. Heroes are your customers or the people who inspire other workers. This is not always the top sales performer – sometimes the hero is the receptionist! Symbols are of course the things that represent your products or services. The simple truth is – when we think like a successful business from the beginning, we set ourselves up to actually build one. To summarize, building a successful business isn’t easy – but you are not the first person doing it. There are many successful examples and we should never waste our time trying to figure out things that have already been proven. Business isn’t simply about money. However, it is about how much of the money that comes into us that we can keep. This financial term for this is margin. This is important because we must set aside those profits to sustain us through a down cycle. Or, we must use it to invest in new products or services to replace existing ones. We must leverage what we have to grow our capital assets. Most importantly as a successful small business owner we must not think small. We must ask an answer the big questions. We must seek outside advice. That’s why Ygetarts loves working with business owners of all shapes and sizes. We love helping them to expand their thinking beyond the limitations of their own fears. This is true when we are consulting them, analyzing things for them, training their staffs, or working with them to develop an online or offline strategy. We love working with them to find realistic goals that to hit in reasonable timeframes that puts food on their table and extra money for future endeavors. Anyone that tries can become a successful small business owner. All they have to do is simply have an idea, connect that to their heart, find their passion, then work towards building a team that loves servicing clients. That is really the only formula for success. Nothing of value gets done alone. Building the business isn’t easy. Again, if it was easy everyone would do it. The best feeling you’ll have as a business owner is the fact that you tried. Success is fun but most lessons will come from failure. Lessons while sometimes tough are certainly what makes us better people. If you want to start a business for fame – then Ygetarts can almost guarantee you failure. If you want to start a business with the idea of being your own boss – Ygetarts can guarantee you that fantasy will fade fast because you’ll soon see that your customers are the boss. If you want to start a business because you’re unemployable – then you have a great shot at success – if you can learn to work with and listen to others. Ygetarts suggestion is that you want to start the business just to try. Try to see if you can do it. You’ll be surprised how easy it is with an open mind.